I had a large green stone laying around after having made a bunch of faux gemstones. 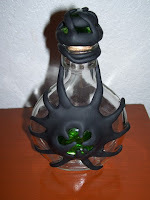 So I decided to make a really creepy cool potion bottle for my Halloween display. Once I had done the bottle, I made a matching lid. I'm going to have to come up with a really dreadful sounding potion ingredient to put in the bottle. Love your stuff. Keep up the good work. You baked the polymer clay with the bottle ?